Dr Jonathon Welch AM and Sing the World 2018 together with Teddington Choral Society and Battersea Choral Society will present the London premiere of Street Requiem at "A Concert of Hope". 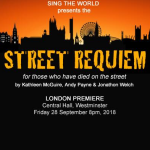 Street Requiem is a contemporary setting of a traditional requiem mass composed by Kathleen McGuire, Andy Payne et Jonathon Welch and it aims to bring awareness about the communities struggling with violence either in the streets or in wars. The evening will also feature special guests artists: David Shannon a well established West End artist, The Highland Divas from USA, the Choir With No Name, Teddington Choral Society and Battersea Choral Society. The various performances will be directed by Jonathon Welch and Sam Evans. All proceeds from this evening will benefit London charities for the homeless included Streetwise Opera and Choir with No Name.